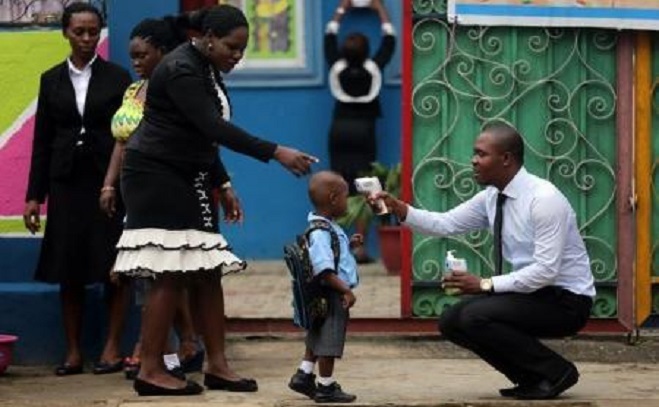 A school official takes a pupil”s temperature using an infrared digital laser thermometer in front of the school premises, at the resumption of private schools, in Lagos in this September 22, 2014 file photo. Liberia said on Friday it would delay reopening schools for two weeks in order to better prepare safety measures against the Ebola virus, which has killed more than 3,650 people in the country but now appears to be receding. Liberian schools, shut since August due to the outbreak, had initially been scheduled to reopen on Feb. 2, but the education ministry said it had pushed back that date to allow parents and students more time to prepare. Some Liberian opposition parties and members of parliament had called for the reopening date to be moved to March 2, concerned that the Ebola epidemic is not yet fully under control. Liberia and its neighbours Sierra Leone and Guinea have been hardest hit in the worst outbreak of the viral haemorrhagic fever on record. The epidemic has killed 8,810 people in total out of 22,092 cases, mostly in the three countries, since it was first identified early last year. The number of Ebola infections and deaths has fallen sharply in Liberia and Sierra Leone in the past few weeks, with just 20 deaths recorded in Liberia in the 21 days to Jan. 25, according to the World Health Organisation, raising hopes that the disease is gradually being brought under control. Guinea reopened schools earlier this month, while Sierra Leone plans to reopen its schools in March.